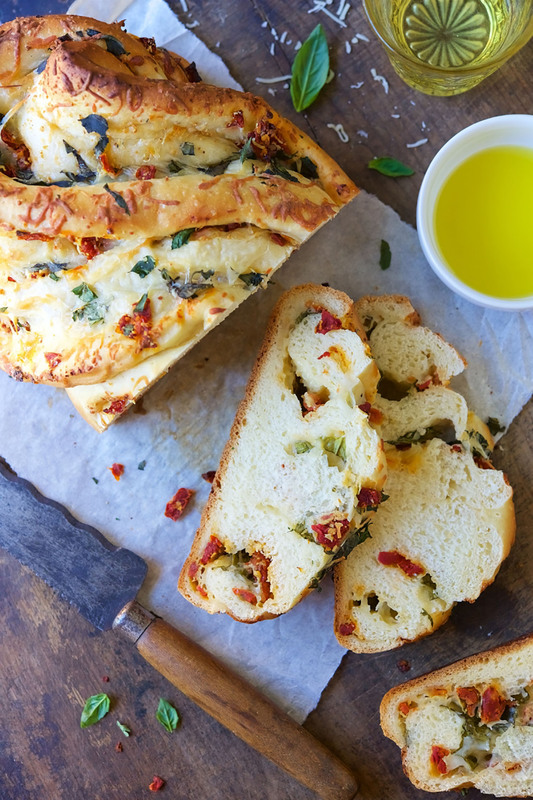 This recipe makes a tasty loaf filled with fresh basil, tomatoes, garlic, and shredded cheese; the bread has wonderful soft texture, and is packed with flavor. The unique shape is simple to achieve, and makes an impressive presentation. Place the dough in a lightly greased bowl, cover, and let it rise until it's doubled in size, about 45 to 60 minutes. Gently deflate the dough. Flatten and pat it into a 22x8½ -inch rectangle. Evenly spread the cheese, tomatoes, garlic, and basil over dough. Place the log seam-side down on a lightly greased or parchment-lined baking sheet. Using kitchen shears, start ½ inch from one end and cut the log lengthwise down the center about 1-inch deep, to within ½ inch of the other end. Recipe in partnership with King Arthur Flour. Substitute all-purpose flour 1:1 for the bread flour in the recipe, if desired. Reduce the water to ¼ cup. When making anything with yeast, including this bread, let the dough rise to the point the recipe says it should, e.g., "Let the dough rise until it's doubled in bulk." Rising times are only a guide; there are so many variables in yeast baking that it's impossible to say that bread dough will ALWAYS double in bulk in a specific amount of time. Chop your basil with kitchen shears, just as you do the sun-dried tomatoes. I’m not usually a bread maker but this was easy w impressive results! Thanks. thanks for the website on how to shape, I don’t make bread, but my goodness, I’m sure inspired to do so now! I am going to make this! It looks amazing. I don’t know where to find King Arthur flour in my area. I am in Canada, Hamilton/St. Catherine’s. I’ve made this bread 5 times now. Very easy. Always a hit with my guest. Just starting to get into making breads. I made this today.. very happy with my end result. Soft, beautiful bread. Looks like the photo. Will be makeing again. Pictures of cutting and shaping the dough into an S would be much appreciated! There are some processing step photos at King Arthur Flour’s website that you may find helpful. Here’s the link: https://blog.kingarthurflour.com/2016/08/08/pane-bianco-bakealong/. So I wanna make sure I read this correctly, you mix all of the dough ingredients together, which means you don’t let the yeast proof separately first? Yes, that is correct! Let us know if you try the recipe. I’m not a baker but I just had to say this is too beautiful to eat! I may just try to make it. Combine 1 tablespoon of ground flax seed with 3 tablespoons of water to replace one large egg.